In this week’s Law of Self Defense Show we announce the launch of the Law of Self Defense Membership program, our alternative platform to our long-standing Patreon page, which we are aggressively exiting. We also continue our ongoing segment entitled “Self-Defense Law Terms That Don’t Mean What You (Probably) Believe They Mean,” focusing this week on the term “Castle Doctrine” and what it actually means and doesn’t mean. Our Q&A segment focuses on whether YouTube videos could be admissible at evidence at trial. 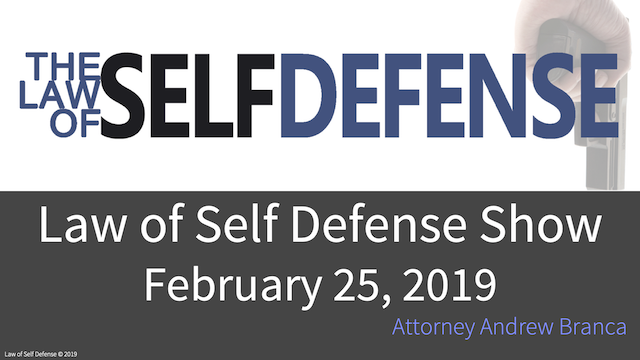 Finally, we also announced a flash 50% off sale on our state-specific Law of Self Defense LEVEL 1 Classes for the states of Ohio, Tennessee, Oregon, West Virginia, and Alaska. Sale in effect only via Wednesday, February 27! You can access today’s show and details on the sale at lawofselfdefense.com/blog. Question. I just joined the blog. Do I need to cancel my Patreon subscription or will you guys just stop billing via Patreon? Thanks.. I just canceled my Patreon account and I gave them an earful, which of course they will ignore, when asked for why I was leaving. Mr. Branca I have a question. I have multiple Black Belts and they are not from McDojos. Four attempt have been made to mug me and one to kidnap. I am physically unable to run. Walk but not run. I am ALWAYS on high alert. My wife only wakes me from a distance. I am 66 yo. and the attacker is much younger. Here’s my question. I am approached by someone I feel (body language, the way I approached, maybe I noticed in his reflection in a store window following me) is going to try and mug me. I back away, put my hands out in front and say stop. My request is ignored and he still attempts to close the distance. Based upon my observations and his disregard of my requests I am now expecting an attack. I have no idea if he is armed. We are the same size. Before listening to your broadcasts my defensive action at this point would have been a roundhouse to the outside of his knee. His knee is now severely injured. I could just leave but I could have been filmed, so I call the police and stay. I tell the police just what I described above but also include that I was in fear of my life or serious bodily injury. Could my training have handled close quarters? Yes, but I have no idea if he had a knife so I do not consider close quarters contact as a viable option. I believe that some might consider my training and conclude that my defense fell into one buck and his into another. My bucket is the severe/deadly bucket and he was in the non-deadly bucket. I recognize that your comment is not legal advice. I also realize that the circumstances of the perceived attack could be vastly different that what I described. I am only asking for your educated opinion based upon the information provided.